In 1847, Sir Charles Isham came back from Germany with a strange set of 21 gnomes. Made out of terracotta, sloppy clay poured into formation, the gnomes sent waves through the United Kingdom as soon as they set foot on British shores. One of the tallest maypoles remaining in England in one of its smaller villages. This preserved puppy was an adorable beacon of charity. 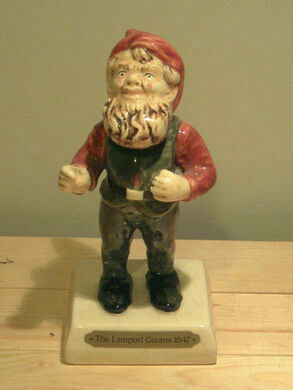 Prior to their arrival in the UK, gnomes had long since been a part of German culture. Phillip Griebel, a German sculptor, was well in tune with popular legends of gnomes in Germany, and began creating them as garden decorations in the 19th century. After reaching the UK with Sir Isham, their spread was unstoppable, especially after Sir Isham sprinkled the grounds of his estate, Lamport Hall with the diminutive decorations. Of the original 21 gnomes brought back from Germany, only one still exists today. Isham’s daughters, who hated the gnomes, removed 20 of them from their property, overlooking only one. The gnome that got away was Lampy, and he has happily made his home at Lamport Hall since his immigration from Germany in 1847. Over 150 years old, he is considered the oldest garden gnome in the world. In 1997, Lampy was insured for £1 million and is estimated to be worth £2 million. Visitors can see the grumpy garden fellow on display in Lamport Hall in Northamptonshire.